Do you have an arborist on staff? Yes. The presence of a certified arborist (or lack thereof) is a solid tell into how seriously a tree company takes itself. Someone with sufficient knowledge and a degree of professionalism will have no problem acquiring the necessary certificates in order to gain legitimacy. Conversely, tree service contractors without these certificates might be new to the business, unsure whether they see a future for themselves in it or simply lacking the knowledge to obtain certification. 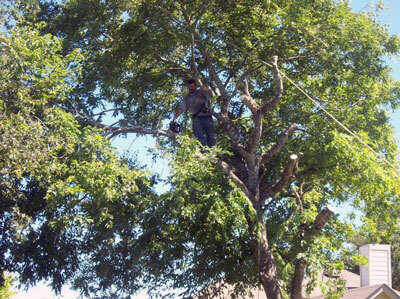 If you're considering doing business with a tree service company, it's in your (and your trees') best interest to ensure that they have at least one certified arborist on staff. Every serious planting, pruning or removal effort should be preceded by an in-depth consultation with an arborist in possession of industry-standard certificates as this will be the only way to know what you're getting yourself into. The same goes for any kind of tree inspection: the training that an arborist receives and the testing necessary to obtain a certificate will guarantee much better detection of every tree-related issue known to man. Keep in mind that many tree ailments are invisible, especially when the trees are being inspected during the spring or summer – working with an arborist is the only way to avoid making a costly oversight that could end up ruining your tree. Like all of our staff members, our arborist is always ready to get in touch with you and see what can be done to help your trees get the treatment they deserve. As prestigious as the industry-leading certificates for arborists might be, don't expect a brash or condescending professional – our arborist will be happy to hear from you and will treat you like a member of our family!